Chumby, along with an unnamed device maker, thinks it can help re-invent the digital picture frame category with its combination of content-driven widgets and social networking. 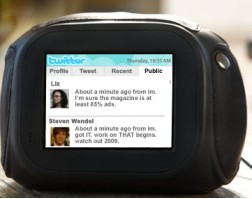 The first Chumby-powered photo frame will be able to display content from photo sites Flickr and Photobucket, along with accessing social networks, such as Facebook and Twitter, as well as news feeds, Internet radio and weather forecasts. Content can be be pushed to other ‘powered by Chumby’ devices so that, for example, users can share photos with other members of their Chumby social network. Internet-connected TVs still remain next on the road map, according to the report, with Samsung and Broadcom said to be partnering with Chumby. Why oh why is it taking so long to get a useful widget-ized photo frame to market? This seems like such a no-brainer product.